After checking, double checking, and even just now triple checking, I find myself in a bit of disbelief that we didn’t include the Night 6 Heeb hottie in last year’s group. 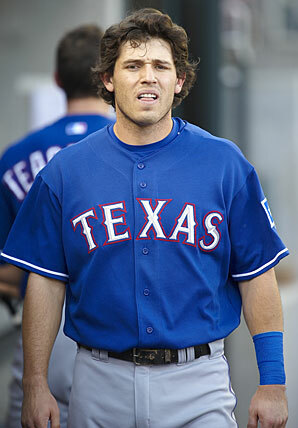 Regardless, I give you the Texas Rangers’ second baseman: Ian Kinsler. Drool over him and a doughnut some more after the jump. Check out the Nebraska cheerleader smiling at the Mizzou touchdown. This past weekend, I roadtripped to Lincoln, Ne. to see my beloved Missouri Tigers play the Nebraska Cornhuskers. We hadn’t won in Lincoln since 1978. Going into the game, we were ranked 4th, so we also had high hopes that the streak would be broken. My Tigers broke the streak and broke it well, winning 52-17. Even better, I ran into my fellow Lady, Miss Minda, a Nebraska gal. M-I-Z! Z-O-U! The Missouri Tigers softball team won their first NCAA Regional in Iowa City this past Sunday. They will now face the third seeded Alabama Crimson Tide in the super regional in Tuscaloosa this weekend. Read more about these ladies and their fantastic run after the jump.